“We the Living” most impacted my life. I grew up in New Delhi, India in the era when few people had landline phones in their homes. My escape was only books; books that I would lift from my father’s locked cupboard. Before I was fifteen years old, I had read Jeffrey Archer, Jackie Collins, and Sidney Sheldon and many more. I can’t say that I preferred one author over the other, as every book gave me something. Over the years, few works have influenced my thinking. During my time of need, a friend long past gifted me Jonathan Livingston Seagull by Richard Bach. It gave me strength to carry on. The Silence of the Lambs by Thomas Harris scared me so much that I avoided reading Harris. have a love-hate relationship with John Grisham. A paperback of Atlas Shrugged by Ayn Rand from Bombay railway station’s roadside seller made me feel as though I am not alone in my thinking. Dubliners by James Joyce reminds me of my longing of New Delhi. Works of Robert Ludlum still keep me engaged; I just finished reading The Sigma Protocol. I am discovering Lee Child. 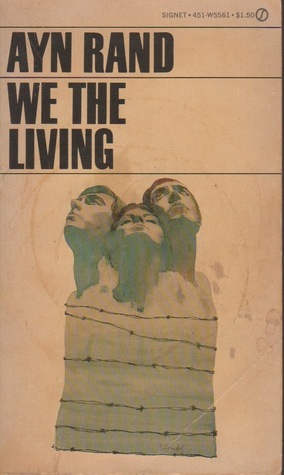 Out of everything, the text I want to live, breath, and imitate, is Ayn Rand’s We the Living (1936). I don’t recall how I found this book. I am unsure; probably it was from a roadside seller in either New Delhi or Bombay. I still have my old paperback. BTW, I read The Fountainhead years after I completed architecture school. There are three main characters in We the Living. (1) Andrei Taganov, communist and Soviet secret police officer, who helped create what Soviet Russia is. (2) Kira Argounova, a young girl of bourgeois Soviet family, who simply wants to live. (3) Leo Kovalensky, a freewheeler who will do anything for his comfort, who wants to escape Soviet Russia. I understand that Ayn Rand’s theme of We the Living is the “evil of totalitarianism” (Leonard Peikoff) contained in the backdrop of 1922 to 1925 Soviet Russia. I don’t comprehend all the philosophical concepts of Rand. I love the book because of its characters. Leo I can never ever like. In Andrei, I find a character who sacrifices his being for the love of another without expecting anything in return. He even manages to adhere to his principles. For most of my adult life, I was in love with Andrei. (This will be news to my husband.) It is so easy to love him. He is the tragic hero, who will never get the girl. I doubt that there is any woman who doesn’t want a man like him. (Spoiler) He knows that Kira doesn’t love him, yet he lives a pauper’s life so he can his money to Kira. She uses that money for the lavish care of her lover Leo. To get the essence of the story, underneath are the first two paras of We the Living. PETROGRAD SMELT OF CARBOLIC ACID. A pinkish-gray banner that had been red, hung in the webbing of steel beams. Tall grinders rose to a roof of glass panes gray as the steel with eh dust and wind of many years; some of the panes were broken, pierced by forgotten shots, sharp edges gaping upon a sky gray as the glass. Under the banner hung a fringe of cobwebs; under the cobwebs–a huge railway clock of pale face and greasy overcoats waited for the train. Kira Argounova entered Petrograd on the threshold of a box car. She stood straight, motionless, with the graceful indifference of a traveler on a luxurious ocean liner, with an old blue suit of faded cloth, with slender, sunburned legs and no stockings. She had an old piece off plaid silk around her neck, and short tousled hair, and a stocking cap with a bright yellow tassel. She had a calm mouth and slightly widened eyes with the defiance, enraptured, solemnly and fearfully expectant look of a warrior who is entering a strange city and is not quite sure whether he is entering it as a conqueror or a captive. ← Synopsis of “Araby” by James Joyce. Enter your email address to follow my opinions and receive notifications of new posts by email.